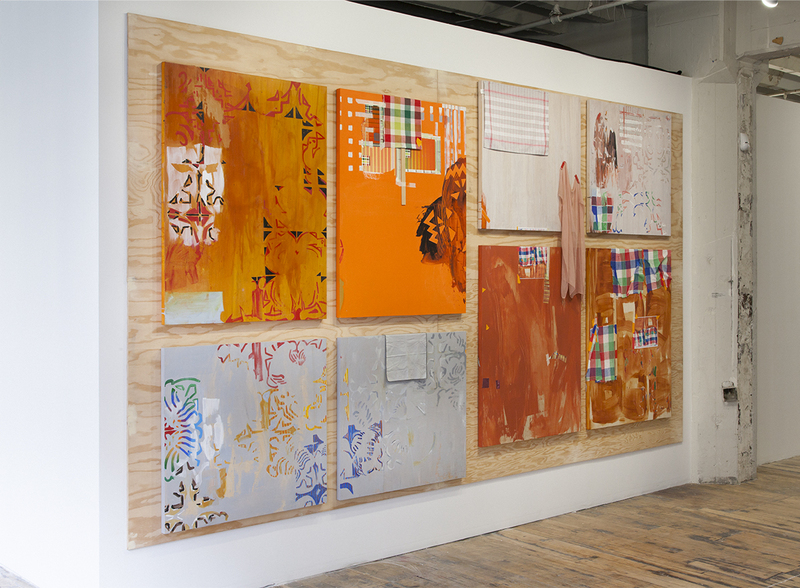 Suzanne Joelson’s assemblage of paintings titled Rhymes with Orange is a kind of visual meditation on the color orange. But just as “nothing rhymes with orange,” the paintings that comprise it live in conversation with one another, a kind of slant-rhyme that bounces meaning and formal devices from one panel to the next, throwing them out into the broader studio and seeing what bounces back and sticks. Suzanne Joelson, “Rhymes with Orange,” 2012. Acrylic paint, tape, wood, staples, cotton and chiffon fabric, inkey photographs, 94 x 156″. On one panel, a photograph of the panel itself was stuck onto the surface, uncannily matching the hue of the paint rendered in the ink of a consumer desktop printer. Matched up to the surface of the painting, this casual photograph (which indexes the upper-right quadrant of the piece) becomes a window onto the window. Suddenly the painting references itself with a view of itself that also fits seamlessly onto its surface. If it weren’t for the thin white border, the space just out of reach of the printer’s heads, the viewer might barely be able to distinguish between the mark of the hand and the imprint of the machine. Joelson’s abstraction lives in conversation with what is not abstract: the messy world of things. The paintings that comprise Rhymes with Orange are strewn with scraps of daily life: dish towels and cloth napkins, partial patterns evoking decorative cement tiles (that were in turn based on ceramic Iznic tiles), bits of bright tape, visible staples, a gauzy scrap of fabric that could be a worn sleeping shirt. These items lead one part of the composition into the next. There’s a note of humor along the way, a nod toward what the artist calls, “the provisional” nature of things. Rhymes with Orange acknowledges structure, but keeps it in a constant state of either dissolving or coming together. Decorative geometric patterns are partially rendered but then bleed off the edge of the image, only to be continued on the adjacent panel, but not in perfect alignment. There’s a sense that one thing has led to another, but that the path has wound back several times for what was forgotten the first time. Just as the gutter of a comic strip contains time, space, and action that the reader must fill in, the space between paintings in Rhymes with Orange keeps us from getting absorbed in one picture without taking into account the others at its periphery. We remain on the material and relational surface of the world, listening in on a conversation between paintings. Nothing rhymes with orange, but rhyming is just one poetic device.